Spray your slow-cooker with cooking spray. 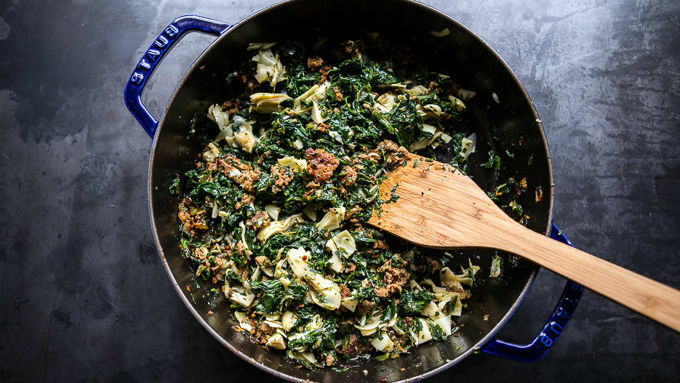 In a large skillet, brown chorizo all over, breaking up meat as you go. Add onion, garlic and jalapeno. Continue cooking for 5 minutes or until the onion is fragrant. 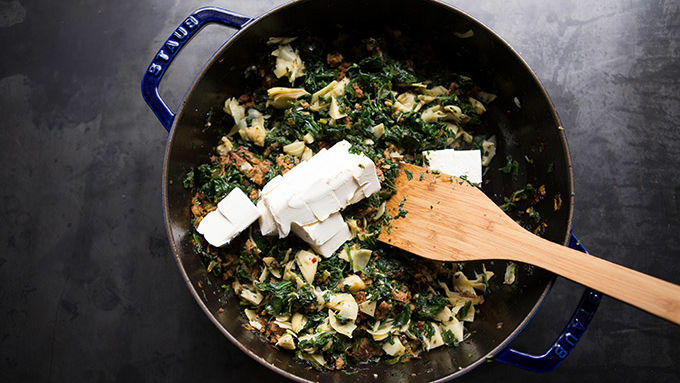 Stir in chipotle chilies, spinach artichokes and pinch of salt and pepper. Remove from heat and stir in cream cheese. 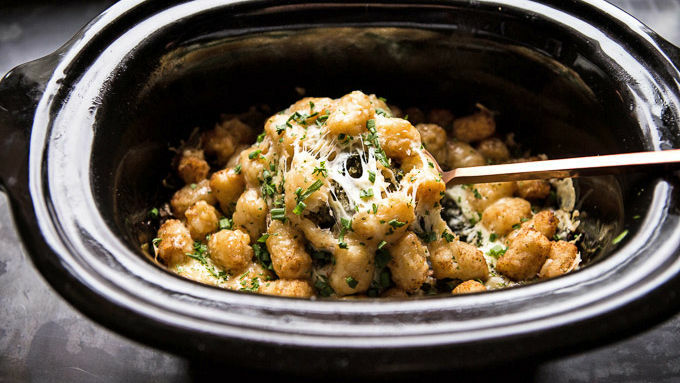 Add half of the tater tots to the bottom of your slow-cooker. Spoon chorizo mixture over tater tots. Add remaining tater tots over chorizo mixture. Add Fontina cheese. Cover slow-cooker and cook for 3 hours on High or 5-6 hours on Low. Serve with fresh cilantro and green onions. If you don’t have a slow-cooker, just preheat oven to 350ºF. 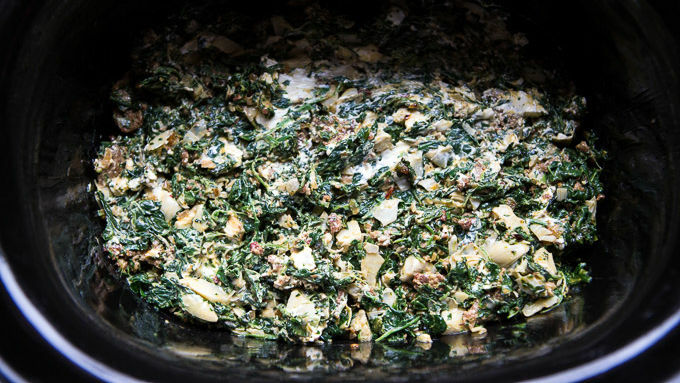 Instead of adding tater tots to slow-cooker, just sprinkle them over the chorizo and spinach mixture. Add the cheese. 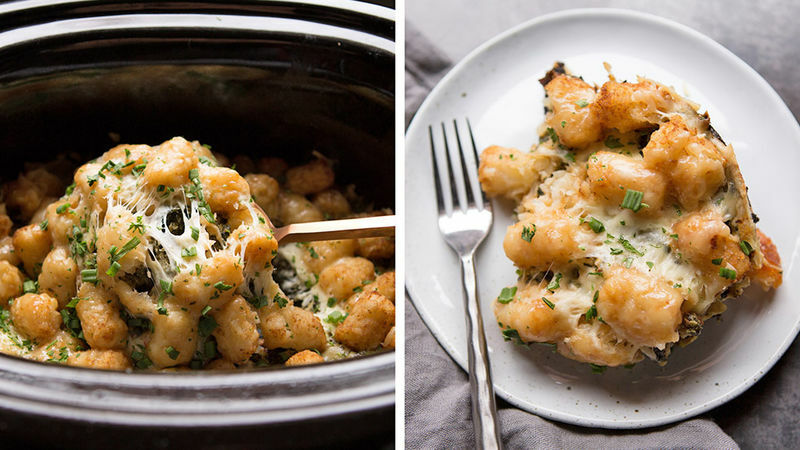 Bake for 30-25 minutes or until the cheese is melted and the tater tots crisp. Enjoy! For the longest time I had no idea what a tater tot hotdish was. Sure, I’d heard of it here and there, but never really thought about looking into what it really was until my older brother mentioned it. Just like a 5-year-old, he loves tater tots. But then again, who could not love them?! I mean, they’re pretty delicious. Anyway, after he said something, I felt it was time to finally make a hotdish. Typically, a tater tot hotdish consists of ground beef, cheddar cheese and tater tots, but I did mine a little differently. For one, I made my hot dish in a slow-cooker so when I came home, dinner was all ready to go! Man, I love cooking with a slow-cooker. Two, I made my filling with spicy chorizo. I’m not a huge fan of ground beef, but I love chorizo! It has so much flavor. Serve with fresh cilantro and green onions and enjoy!